Today we were looking for Jesus. This past Wednesday, a group of fifteen women from the US came down to Montaña de Luz on a service trip. Most all of the women have been here before, some several times. It is a unique group for a variety of reasons. First, they have such a long standing familiarity with Montaña de Luz and the children. They also are not coming with the expectation of providing some specific service. Rather, they are here to offer a “camp” for our kids as well as the community kids. They are “Team Navidad.” They have offered the kids and us an experience that is helping all of us to prepare for the coming of Christ. At the same time, I have really been looking for Jesus. On Friday I was in Tegucigalpa helping with the week’s purchase of supplies. I will take over this task when the volunteer that has been doing it finishes her time at Montaña de Luz in a couple of weeks. We were buying a lot of Christmas supplies, both for the group and in general. Laura and I have very little by way of Christmas decorations, and I thought it would be nice to have a manger. A store we went into offered plastic ones: very cheap and artificial looking. They cost about twenty dollars. The slightly nicer ones cost fifty. I refused to buy it. So I still had not found Jesus. Today we went with the fifteen women to a town that offers art work and Honduran tourist souvenirs. We were Christmas shopping. It was a very fun outing. Laura and I found a store with a variety of religious items. 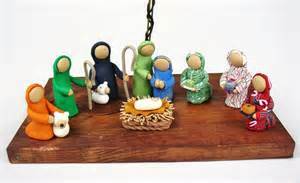 I found a small clay manger set, nicely crafted, for a modest price. I purchased it, so happy that we would have Jesus in our home for Advent, in preparation for Christmas. I unwrapped each piece very carefully when we got home. The three kings, the shepherd boy, Joseph, Mary, and all the animals were all there, but guess who was missing? Jesus. The man at the store must have inadvertently forgotten to wrap the Prince of Peace, and I was left with all the characters and animals adoring and presenting their gifts to an empty hay trough. After spending so much time looking for Jesus, I just wasn’t going to find him. Still, the lack of his presence made me reflect a little about our kids at Montaña de Luz. I wondered whether for all this talk about his impending coming, had they found him? These are the kids that have been gravely affected by an insidious disease for which they did nothing to deserve. Either they came into the world already infected with HIV, or someone severely abused them, or people who were supposed to love and care for them died or abandoned them. These are the children, whose physical and emotional growth has been stunted, perhaps from maternal alcohol and drug addiction, malnutrition, and lack of medical care, or simply because they take powerful drugs to keep them alive. These are the children for whom some family member decided that their care or their food would cost too much and therefore they would be given away. These are the children who crave for one mother or one father who will lovingly care for them, but must instead accept many changing, surrogate parents whom, even with the best of intentions, will utterly fail them. These are the children who have suffered tremendous disrespect and will sometimes hate themselves rather than feel the rage that erupts within them. Maybe Jesus is not so easy to find after all. Maybe he’s not in our Christmas carols, or among the beautiful adornments. Maybe I can’t purchase him as a piece of plastic, or even as a finely, crafted, clay sculpture. Maybe we have to search a little deeper. I suppose he wasn’t so easy to find in Bethlehem either; behind the inn, in the cold, in the dark, in a barn. Even though he’s not easy to find, I’m pretty sure he’s with our kids at Montaña de Luz. If he wasn’t there, I can’t imagine that these kids would have any hope. Besides, Montaña de Luz seems like the most likely place where he would be born. I think I will just have to keep looking for him. Maybe searching for Jesus is much more important than finding him. Just keep looking. Paul – I beg to differ. I don’t think you need to look far to see Jesus. I saw him in the face of every MdL child, in the face of every person who greeted us in Nueva Esperanza as we caroled through their village, in the faces of the cooks and tias at MdL, and so many more. I also found him in the faces of a very special couple who left their life in Massachusetts to bring their gifts to children and a community of strangers. You don’t need to look for Christ in a cheap piece of plastic. Just look in the mirror. Paul – this was a fantastic post. Your paragraph about trying to find Jesus was so clever – I laughed out loud when I realized that you were looking for an object, not the spirit of Jesus. I have no doubts that you can find Jesus everywhere. I’m even more impressed that you can describe your search for him in such a humorous and engaging fashion.